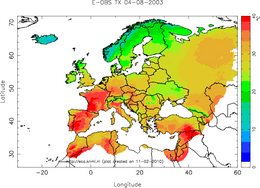 Welcome to the website of the European Climate Assessment & Dataset project. Presented is information on changes in weather and climate extremes, as well as the daily dataset needed to monitor and analyse these extremes. 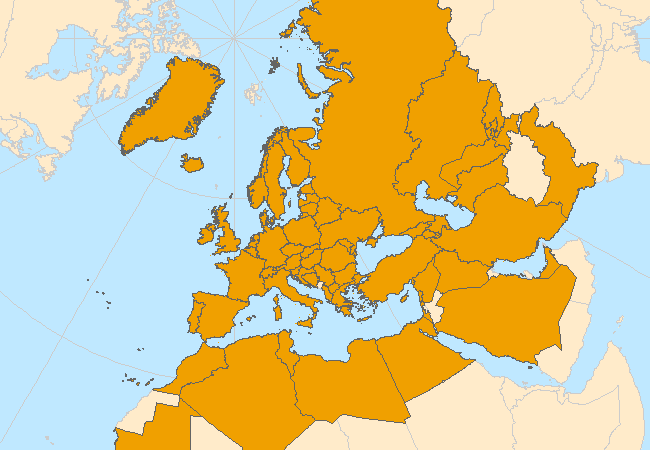 ECA&D was initiated by the ECSN in 1998 and has received financial support from the EUMETNET and the European Commission. The database is updated until: Mar 31, 2019. March 2019 - E-OBS v19.0e has been released. March 2019 - Updates until the end of 2018 have been included for Spain kindly provided by Aemet. March 2019 - Updates for 2017 have been included for the UK (kindly provided by National Climate Information Centre). March 2019 - New data for Italy (254 stations) kindly provided by Italian National Institute for Environmental Protection and Research (ISPRA) . March 2019 - Updates for July - December 2018 are kindly provided by the Meteorological Service of Catalonia. January 2019 - Updates of the Serbian stations are kindly provided by Republic Hydrometeorological Service of Serbia. December 2018 - Sunshine duration data updated from 1947 onward for Luxembourg Airport, kindly provided by MeteoLux. December 2018 - Precipitation data from 158 rain gauges from Sardinia are added, kindly provided by the ARPA Sardegna. November 2018 - Global radiation data from 441 European station are added, kindly provided by the World Radiation Data Centre. October 2018 - Updates of 27 stations for Snow Depth and updates of 9 stations for Temperature are kindly provided by the Estonian Environmental Agency. August 2018 - Updates for January - June 2018 kindly provided by the Meteorological Service of Catalonia. May 2018 - New temperature series from 211 stations included for Lombardia (Italy), kindly provided by the ARPA Lombardia. ECA&D forms the backbone of the climate data node in the Regional Climate Centre (RCC) for WMO Region VI (Europe and the Middle East) since 2010. The data and information products contribute to the Global Framework for Climate Services (GFCS). Today, ECA&D is receiving data from 69 participants for 63 countries and the ECA dataset contains 54232 series of observations for 12	elements at 15563	meteorological stations throughout Europe and the Mediterranean (see Daily data > Data dictionary). 81% of these daily series can be downloaded from this website for non-commercial research and education and ECA&D and the gridded dataset E-OBS enjoy widespread use in Europe. Participation to ECA&D is open to anyone maintaining daily station data. If you want to join please contact us. See our data policy for more details. E-OBS version 19.0e has been released. E-OBS is a daily gridded observational dataset for precipitation, temperature and sea level pressure in Europe based on ECA&D information. The full dataset covers the period 1950-01-01 until 2018-12-31. It has originally been developed and updated as parts of the ENSEMBLES (EU-FP6) and EURO4M (EU-FP7) projects. Currently it is maintained and elaborated as part of the Copernicus Climate Change Services project. ECA&D has close links with the projects and initiatives below.